An eccentric geology professor acquires an old book and finds an ancient parchment hidden within its pages. On it is a coded message that reveals directions to a secret passageway that leads deep within the earth's interior. 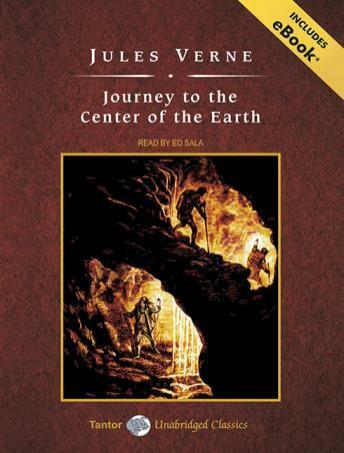 The professor immediately sets off on a daring journey to Iceland, where he and his companions enter into an extinct volcano and make their way to the center of the earth. They soon find a strange underground world where the laws of science are turned upside down. They discover huge caverns, luminous rocks, a subterranean sea, primitive forests, and fearsome prehistoric creatures that time had forgot. The travelers encounter one stirring adventure after another as they explore deep within the bowels of the earth. Good story, but the narrator was a big mono-toned and lacked inflection in his voice. It seemed like he was reading an owner's manual at times.